Punctuation as Configuration; or, How Many Sentences Are There in Sonnet 1? 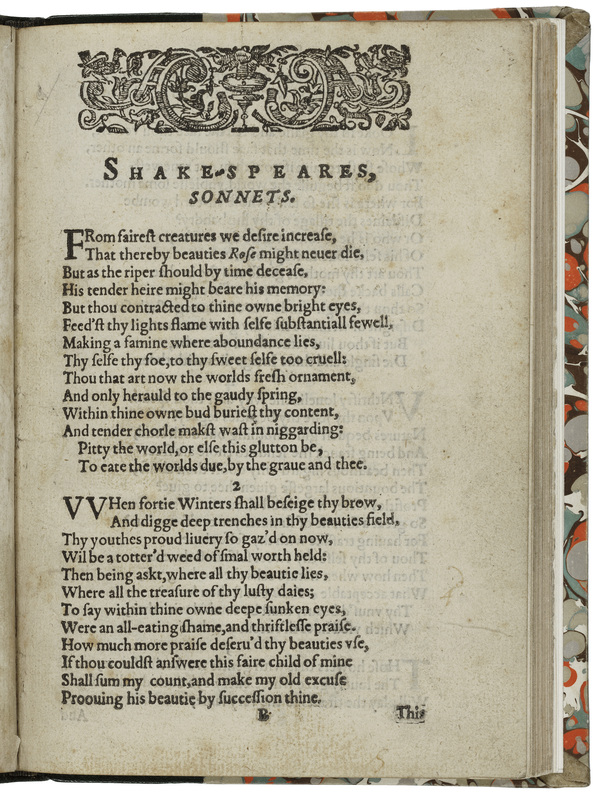 Shakespeare's Sonnets, produced in the last great age of manuscript circulation, have long enjoyed a special relationship with the printing press. In academic debates about Shakespeare as author for page versus stage, the poems have often served to suggest that he was not averse to playing the part of the literateur or to seeing his texts in print. And in the modern Fine or Private Press movement, the Sonnets have become what Andrew Hoyem (of San Francisco's Arion Press) describes as "the ultimate 'chestnut' of pressbooks," bringing together the most beautiful poems in the English language with the finest in typographic style. 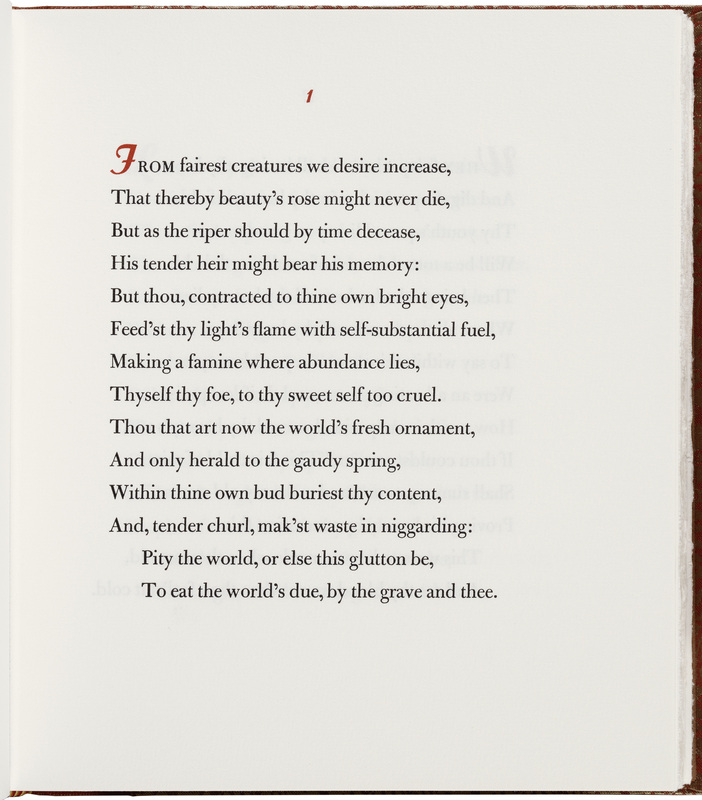 In 1997, Hoyem overcame his reluctance "to add yet another volume to the sagging shelf of Shakespeare's poems in this form" and produced an exquisite edition, prepared by Helen Vendler, printed in newly cast type, and bound in red leather and floral brocade. 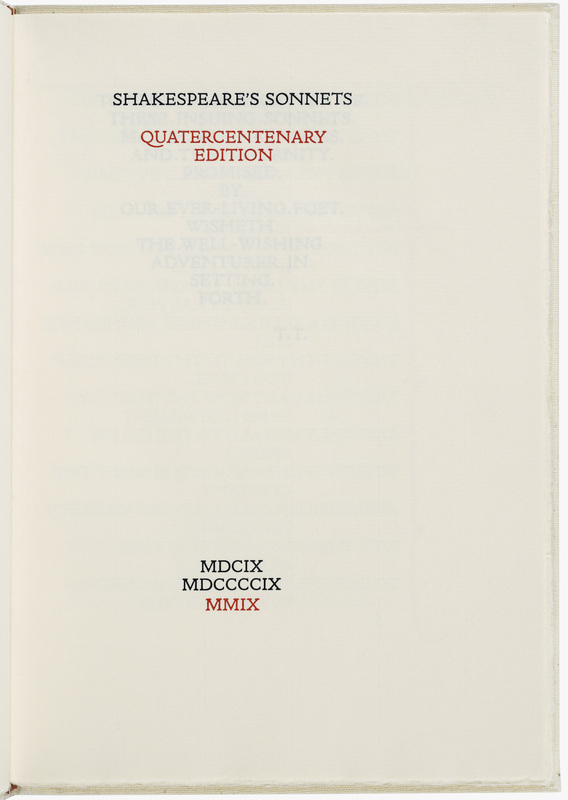 It is hardly surprising, then, that when master-printer Jonathan Finegold chose the auspicious year of 2009 to open his New Albion Press, the first book he produced was the Quatercentenary Edition of Shakespeare's Sonnets (Figure 1)--issued in a standard version of seventy-five numbered copies and a deluxe version of twenty-six lettered copies, hand-printed on laid paper and bound in terracotta goatskin stamped with real gold. Anniversaries are particularly resonant moments of (re)configuration, and Finegold's edition marks a series of milestones in the textual life and afterlife of Shakespeare. The dates of publication on the title-page (MDCIX - MDCCCCIX - MMIX) link the edition to not one but two earlier books: as Finegold explains in the colophon, it was printed to celebrate "the four hundredth anniversary of the first printing of Shakespeare's Sonnets and the one hundredth anniversary of the edition printed by T. J. Cobden-Sanderson at the Doves Press" (successor to William Morris's Kelmscott Press and producer of some of the twentieth century's most beautiful books). Finegold's volume is as much a Centenary as a Quatercentary edition, then, and, in form and function, it may owe more to Cobden-Sanderson than to Eld or even Shakespeare. Figure 1: THE TITLE-PAGE OF THE QUATERCENTENARY EDITION OF SHAKESPEARE'S SONNETS (NEW ALBION PRESS, 2009). Courtesy the Folger Shakespeare Library and the New Albion Press. A quick glance at the opening sonnet in the New Albion and Doves Press editions [Figures 2 and 3] reveals that the former is, in effect, a character-for-character type facsimile of the latter--no mean feat since the entire Doves font was thrown into the River Thames by Cobden-Sanderson in 1917, bringing an abrupt end to an increasingly unhappy partnership (Cable, Garfield, Tidcombe). Using Torbjörn Olsson's reconstructed type, Finegold has carefully followed every aspect of Cobden-Sanderson's distinctive design, seen at its most striking in Sonnet 1. In a major departure from Eld's original presentation [Figure 4], the first two poems are given their own pages and set in all-caps, in a style associated with monumental inscriptions. The final word or phrase in every line is wrapped around and indented to the middle of the page, giving the block of text a dramatic new shape. The density of the right side enhances the open spacing of the openings of lines on the left; and the column running down the middle is balanced by the page-long stem of the initial "F"--stretched from the squat two-line capital in the 1609 Quarto into an elegant marginal ornament, designed by Edward Johnston and cut by Noel Rooke and Eric Gill--that both frames the whole poem and marks its constituent parts. The tapered cross-bar (which literally bears the "memory" in line 4) and two pairs of diamonds (like colons turned on their side) divide the three quatrains that lead, in the typical Shakespearean sonnet, to a final rhyming couplet. Figure 2: SONNET 1 IN THE QUATERCENTENARY EDITION OF SHAKESPEARE'S SONNETS (NEW ALBION PRESS, 2009). Courtesy the Folger Shakespeare Library and the New Albion Press. Figure 3: SONNET 1 IN THE TERCENTENARY EDITION OF SHAKESPEARE'S SONNETS (DOVES PRESS, 1909). Huntington Library RB 607694, the copy given by Cobden-Sanderson to Furnival. Courtesy the Huntington Library. 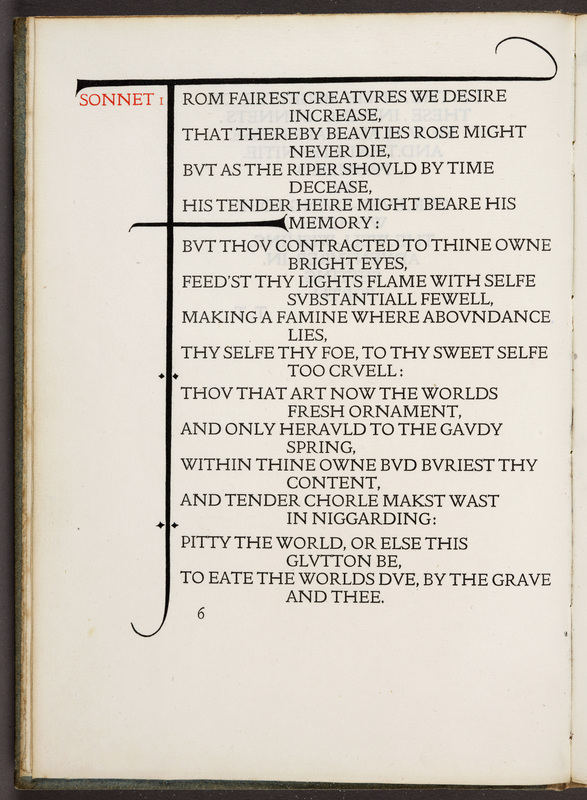 Figure 4: SONNET 1 IN SHAKE-SPEARES SONNETS (1609). Courtesy the Folger Shakespeare Library. While Finegold follows his typographical model with exceptional fidelity, he does introduce a few touches of his own. The most conspicuous change on this page is the printing of the initial F in red rather than black, a move that makes its form more vivid but sacrifices Cobden-Sanderson's clear distinction between poem and title. A far more significant modification, apparent in virtually every line of every poem, is the modernization of the spelling and punctuation. Finegold's emendations make for diction and syntax that are easier, to be sure, on the modern eye. For instance, line 12's "AND TENDER CHORLE MAKST WAST IN NIGGARDING" becomes "AND, TENDER CHURL, MAK'ST WASTE IN NIGGARDING": the added commas give readers extra cues that will help them to parse the line. Likewise, Finegold removes a comma at the end of line 9 that is strictly superfluous since it separates two descriptions of the same person. But he makes some larger changes that ought to give us pause for thought--including the editing out of what we might call the "serial colon," a feature that breaks modern rules but turns out to be a pervasive feature of pre-modern punctuation, particularly in passages where the speaker is pausing for thought, for breath, or for effect (Sherman). Eld and Cobden-Sanderson end all three quatrains with a colon, making the entire sonnet one complex sentence with three linked segments leading to the couplet's closing exhortation. Finegold changes all three colons to full stops, transforming the sonnet into a sequence of four more or less discrete sentences. When I undertook the reprint of Shakespeare's Sonnets, thinking that for so exquisite a form of poetry the punctuation should be as exquisite, I decided to make an exception to my rule of following the text and to revise what had superficially seemed to me arbitrary and haphazard in the punctuation of the original. I accordingly revised the punctuation of the 1609 edition, sonnet by sonnet; & a fascinating & alluring balancing of nice probabilities I found it to be: but as I proceeded I found two other & more important things, first, that slowly, like the coming on of night, I was changing the whole aspect of the Sonnets, and, secondly, that the original punctuation had a method in its seeming madness.... I therefore cancelled all the sheets I had already printed, both vellum and paper, and began the edition over again, keeping, with few exceptions, punctiliously to the punctuation, and to all other characteristics, of the original (Cobden-Sanderson, 1-2). Cobden-Sanderson's emphasis on "original" forms and conditions may now strike us as naive; but it was very much in keeping with the cultural nostalgia of the Arts and Crafts movement, and largely untroubled by the later scholarship (bibliographical and philosophical) that would challenge our faith in access to Shakespeare's original or authentic texts. What is more surprising here is the sense that modernization may bring darkness rather than light to the Shakespearean poem, obscuring rather than illuminating its essential structure and style. For Finegold, the opposite is true. Enlisting the support of "the best recent scholarship as to the spelling, punctuation, and meaning of the Sonnets," he suggests that the original punctuation creates an unnecessary obstacle to the modern readers who will use his book, one that gets in the way of "the flow of the poetry" (Finegold). Finegold is following the pattern established by virtually every major current edition--from Private, Trade or Academic presses. The Folger Library edition, like Finegold's, changes all three colons to full stops, while those of Stephen Booth (Yale) and Katherine Duncan-Jones (Arden) keep only the first. Helen Vendler (Harvard/Arion), Colin Burrow (Oxford) and G. Blakemore Evans (Cambridge) opt for alternating colons and periods [Figure 5], which retains much of the rhetorical complexity of the original while conforming to modern conventions. Furthermore, their version makes the first eight lines a single sentence-level unit while also linking the final six. 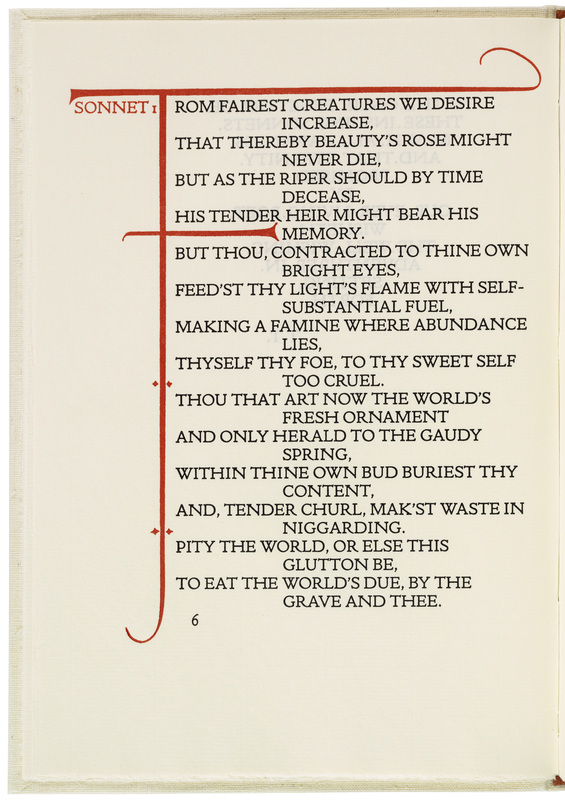 Figure 5: SONNET 1 IN VENDLER'S ARION PRESS EDITION (1997). Courtesy the Folger Shakespeare Library and the Arion Press. While none of these editors comments directly on their choice of punctuation, readers familiar with the history of the sonnet will realize that more is at stake in these numerical patterns than the relative strength of the links between independent clauses or the relative length of line-end pauses. The Italian (or Petrarchan) sonnet adapted by Shakespeare and his English contemporaries is distinguished by a two-part structure of eight-line octave and six-line sestet. And while the "primary structure" of Sonnet 1, according to Vendler, signals a change after the first four lines (from "desirable" to "actual" and from first-person plural to direct address), she observes that "the ghost of the Italian sonnet can be said to underlie all the sonnets in [Shakespeare's] sequence" and suggests that in cases like this one there is a "shadow sonnet...behind the sonnet we are reading" (49-50). The 1609 punctuation keeps both sonnet forms open, though it requires hard work by readers to make their way through them; the pattern chosen by Finegold and others makes the reader's job easier, but leaves the ghost of the Italian sonnet in the shadows. There are, in other words, various argumentative, rhetorical, and generic structures at work in Shakespeare's sonnets, which can be enhanced or effaced by changes in punctuation. This does not necessarily mean that Eld and Cobden-Sanderson got it right and that Finegold et. al. got it wrong, but it does suggest that punctuation marks are more complex and consequential than we tend to imagine, and prompts us to ask a series of questions: What kind of punctuation does the best job of giving modern readers access to early modern texts? Whose punctuation is preserved in editions like Eld's 1609 Sonnets? What was the function of a colon in Shakespeare's day and what, for that matter, was a sentence? The problem of punctuation is by no means exclusive to the Sonnets. While the play of commas, colons and full stops may be more concentrated in the limited space of a sonnet, the existence of multiple versions and the extra dimension of cues for theatrical performance make the interpretive challenges even more vexing for readers and actors of Shakespeare's drama. And yet, despite the obvious importance of these questions for the sense we make of Shakespeare, they have rarely been asked. "It is common practice at the present day," Percy Simpson observed in 1911, "to treat the punctuation of seventeenth-century books as beneath serious notice; editors rarely allude to it, and if they do, they describe it as chaotic and warn the reader that they have been driven to abandon it" (7). A century later, Jonathan Crewe argued that we still have not moved beyond the attitudes of one of Shakespeare's 18th-century editors, Samuel Johnson, who explained that, "In restoring the authour’s works to their integrity, I have considered the punctuation as wholly in my power; for what could be their care of colons and commas, who corrupted words and sentences? Whatever could be done by adjusting points is therefore silently performed...." As we enter the twenty-first century, Crewe observed, "repunctuation, often silent, remains a prerogative assumed by those editing Shakespeare’s texts for the mass market and even for fairly restricted academic circulation" (Crewe 23). Almost every other issue involved in presenting early modern texts in modern forms--including the problem of inconsistent speech prefixes and absent stage directions, the challenge of multiple texts, and the presence of other authors and agents in the line of transmission--has been thoroughly debated, with visible and sometimes radical implications for our editorial and interpretative practices. But when it comes to punctuation, editors are now given minimal guidance and total power, while readers and viewers, for their part, are almost entirely unaware of the silent performances that have profoundly shaped the Shakespeare they see and hear. The writer is in a permanent predicament when it comes to punctuation marks; if one were fully aware while writing, one would sense the impossibility of ever using a mark of punctuation correctly and would give up writing altogether. …The writer cannot trust in the rules, which are often rigid and crude; nor can he ignore them without indulging in a kind of eccentricity…. The conflict must be endured each time, and one needs either a lot of strength or a lot of stupidity not to lose heart (305). What Adorno says of writing applies--with less irony--to editing. As those of us who have been strong or stupid enough to take it on can testify, the conflict must be endured not just each time we edit but each time we encounter a punctuation mark--particularly when they appear where we think they shouldn't, when they don't appear where we think they should, or (worst of all) when they appear in a form for which there is no obvious modern equivalent. In fact, it may not be going too far to suggest that every piece of punctuation poses something of a textual crux. Shakespeare's punctuation looks and feels right in its proper context [and] looks, feels and is wrong when applied to a modern standardized text. ...in order to punctuate according to modern rules, an editor is often forced to make up his mind about the meaning of the original. This means that the sense of the poem is narrowed down; it is often robbed of a multiplicity of meaning which may be an inherent part of it. Secondly, the rhythm is interfered with. Thirdly, it is plain that violence will be done to the complex structure... (37-38). When John Dover Wilson edited the Sonnets for the Cambridge Shakespeare three years later, he followed a similar policy: "to impose a modern punctuation upon the Sonnets would indubitably lead to misrepresentation. The only safe thing then, the only scholarly thing, to do is to leave the Q text virtually unchanged in this respect" (cxxiv). But when the Oxford Shakespeare finally appeared (in both old- and modern-spelling editions) in 1986, its editors were far more comfortable with modernization: indeed, they had literally written the book on updating Shakespeare's spelling for modern readers (Wells and Taylor; Wells). And over the last few decades, it is safe to say, silent repunctuation has become the order of the day for poems and plays alike. Editors are traditionally forced to justify departures from their early modern copy texts, and they are supposed to have a good reason if they change some feature in the most authoritative early text. But this burden is largely lifted when it comes to punctuation. How did this position come to win out and on which arguments and/or assumptions does it rest? 1. Punctuation plays at best a secondary role in the production of meaning: it is the words, rather than the marks between them, that count. This widespread (but usually tacit) assumption lies at the heart of modern editorial theory and practice and derives in part from W. W. Greg's influential division of texts into "substantives" and "accidentals." He put punctuation in the latter category alongside spelling and layout, describing them as surface features that shape and inflect but do not usually create or contain the verbal meaning found in the so-called substantives--that is, the words themselves. The net effect of Greg's argument was to set in editorial stone the already prevalent tendency to see punctuation as an adjunct to rather than component of meaning: Vivian Salmon has explained that the term "accidental," as it became hardened in editorial ideology, implies that the marks between words are contingent rather than constitutive, the product of happenstance rather than control. The Latin etymology suggests that they simply fall onto the page and might just as well have fallen elsewhere; and the relevant entry for "accidental" in the Oxford English Dictionary defines them (citing Greg) as "any feature that is non-essential to the author's meaning." 2. Sixteenth-century practice was so primitive and inconsistent as to be almost useless to modern readers. Everyone who writes about punctuation in the sixteenth and seventeenth centuries spends some time explaining two things. First, that until the sixteenth century there were only four punctuation marks in general use (comma, colon, period, and question mark), and that the great European printers introduced new ones that were adopted by writers in a slow and irregular fashion over the ensuing centuries (Parkes 41-61). And second, that these marks served two different systems that were both in play during Shakespeare's day. We now see the function of punctuation as primarily grammatical, intended to guide us through the structure of a sentence by clarifying the relationship between the separate syntactic units within it. But in the Renaissance there was a second (and, to some extent, dominant) approach that can be described as rhetorical or oratorical, indicating pauses for breath and changes of pitch--a form of marking that becomes increasingly obsolete, or at least subordinate, as we move toward the present (Parkes; Ong; Salmon; Graham-White). 3. Early modern punctuation is too difficult or confusing for modern readers to handle: it must therefore be translated into a form that they can understand--and can, indeed, be done so without losing anything essential to the original effects. Fredson Bowers was as committed as anyone to the recovery of texts as their authors would have wanted them to appear, and he regularly argued for the retention of original spelling and pointing. But if editors decide to modernize, he had little patience for halfway measures and suggested, for instance, that "it is absurd to argue that Elizabethan flexibility and rapidity cannot be indicated by especially light modern pointing" (138-39). 4. The transmission of Shakespeare's texts has involved so many intermediaries that the hope of recovering Shakespeare's own habits is all but futile. According to the useful summary of Peter Stallybrass and Roger Chartier,scripts required collaboration--of the professional actor to phrase the words and, if printed, of the compositor to "point" them. The instability of the text, while increasingly emphasized by modern theatrical and editorial practices, is the material result of the multiple agents in the theaters and printing houses, all readers of the text, in the making of the performances and books through which spectators and readers encountered specific versions of the script/text. There is no single 'original' text that we can find behind the various materializations of Hamlet (37). He remarks that "Line 4 is isolated between colons, carries the whole weight of the pathos, and is a pivot round which the rest of the Sonnet turns." Empson's comments on this and other sonnets are stimulating, but it is worth pointing out that line 4 is "isolated between colons" because the page on which it appears was set by Compositor A [who had a marked preference for colons] (8). Likewise, T. H. Howard-Hill has warned us against attributing the clusters of colons found in some of the First Folio plays to Shakespeare himself since they were prepared for the printer by the scribe Ralph Crane and the frequency of colons found in his texts is roughly twice that found in the rest of the volume (32, 82). Similar uses of the serial colon can be found, however, in plays that were not prepared by Crane and patterns like the one identified by Empson cannot be simply pinned on the carelessness or quirkiness of a particular compositor. First and foremost, they point to patterns that were produced at the time of Shakespeare and even if they are not Shakespearean they may point to structures or effects that were familiar to his earliest readers (Carter 427-28). And second, it is by no means clear who is responsible for the patterns found in the 1609 pointing: serial colons are found in no fewer than 32 other sonnets, only half of which were set (according to Jackson's own assignments) by Eld's Compositor A, and these help to sustain no fewer than ten sonnets that stretch out, in the Quarto's punctuation, over a single sentence, all but one of which were set by Compositor B. There are elaborate examples of serial colons throughout the plays in Shakespeare's First Folio, particularly in speeches associated with clowning and soliloquizing, suggesting that a string of colons may have signaled a particular set of speech-acts or -genres in the sixteenth and seventeenth centuries (associated, I would suggest, with the turning of phrases, the unfolding of ideas, the weighing of options, or the finding of one's way). So in scripting "a speaker who seems to think his way to his conclusions before our very eyes," as Vendler described the effect of Shakespeare's sonnets, the serial colon may have been the pointing of choice (Shakespeare, The Sonnets, ed. Vendler n.p.). It is clear, at any rate, that the colon fulfilled a number of functions. In both the logical and the rhetorical system deployed by Shakespeare's contemporaries, colons mark a pause that is longer than a colon but shorter than a full-stop, and they also indicate a part of a larger sentence that is not yet complete. In Charles Butler's English Grammar of 1633, the colon is described as "a point of perfect sens[e], but not of perfect sentenc[e]" (sig. H1v). This formulation may derive from Quintilian's Institutio Oratoria, the Renaissance period's most influential classical handbook on the art of rhetoric. In the section on punctuation in Book 9, Chapter 4, Quintilian explains that the colon is "the expression of a thought which is rhythmically complete, but is meaningless if detached from the whole body of the sentence, as the hand, foot or head if separated from the body" (3:577). In early Greek and Latin usage, the colon refers not to the punctuation mark but rather to the clause (or, literally, member) which it accompanies; and since rhetorically effective sentences often need multiple clauses before they bring their sense to an end, classical authorities accepted that there could be many cola in a sentence. Quintilian says that Cicero advocates an average of four, and finds them especially useful when we want to "relax the texture of our periods by considerable pauses and looser connexions" (3:579). the Grekes cal colon...which is in inglish the iointes, or that which is betuixt the iointes...for that yt devideth the membres of a sentence, as our ioints doo the membres of our bodies: whose quantitie is dooble, of that of the foresaid rest, which we may compare to the minem yn music.... The same membre may containe 1. 2. 3. or more of the said restes: and his use is; as you see in everi periode...in this boke written: that is to sundre...membres of sentences...as, I am veri glad of your prosperite: for I herd say you were in trouble: which now appeareth otherwise: and so of others (Danielsson I:159-60). By the time Ben Jonson wrote not only his plays but his own textbook on English Grammar, he joined Aldus and Hart in combining the different functions of punctuation: in the organic body of the text, logical punctuation marks its skeletal structure and rhetorical punctuation marks its breath or music (Van den Berg; Smith; King). Faced with an author working with such a different understanding of language, Stephen Orgel suggested in his Yale edition of Jonson's Complete Masques, "no method of modernizing can be wholly satisfactory" since "Elizabethan syntax was vastly different from ours, and included devices for which there is no equivalent" (44). Like many other editors of early modern texts, he has tried to help his readers by lightening Jonson's heavy marking and clarifying his tangled syntax, but unlike most of them he does so with a full awareness of what is lost as well as gained in translation. When we modernize the punctuation in Renaissance plays or poems, we are not so much replacing one system with another as taking texts from a culture where two (or more) different systems are in open and often ambiguous play into a culture where one has won out. This problem led Orgel to acknowledge that "attempt[ing] to reduce Jonson's practice to ours is as impossible as it is misguided," and Michael Warren to argue that editors should be much more cautious in removing non-modern pointing and much more generous in telling readers what exactly is being removed. The serial colons in Shakespeare's sonnets are, I would suggest, a particularly interesting case in point. The Tercentenary Edition was printed in 1909 with a print-run of 250 copies on paper and 15 on vellum. Between 1900 and 1917, Cobden-Sanderson and his colleagues produced some fifty titles and are best known today for the exquisite five-volume Doves Bible (1902-4). The iconic Doves font was based on designs by Cobden-Sanderson's principal partner Emery Walker and cut by Edward Prince. All three men had worked with William Morris at the Kelmscott Press and, while they shared many of his aesthetic and political leanings, they set out to replace Morris's Gothic style with the simplicity and elegance of Renaissance typography. For a detailed history and descriptive catalogue see Tidcombe. The poem-per-page layout has been a conspicuous feature of Fine Press editions, including those produced by the Arion Press (1997), the Plantin Press (1974), and the Shakespeare Head Press (1905). Since it doubles the size of the volume, there is an obvious appeal to printers of these special editions, making for a more fitting monument than the slim and scruffy First Quarto. As Vendler put it in her introduction to the Arion Press edition, "In their original quarto version, printed on ordinary paper, two sonnets to a page, the poems appear fugitive and perishable. ...In this edition, each of these memorable poems is given its due--a page of its own. Here each sonnet can shine bright." In his journal, Cobden-Sanderson recorded Furnivall's response: "I am sorry that you are not going to repunctuate the Sonnets. They want it badly. ...Your Hamlet practice was the right one: edit, and give notice of change. Let facsimilists reproduce old blunders, uncorrected" (Tidcombe 166). Cobden-Sanderson was not persuaded and he stuck to his guns in future printings of Shakespeare: in his Anthony and Cleopatra and Venus and Adonis of 1912, he only corrected obvious errors and otherwise offered "the unchanged punctuation of the original" (Tidcombe 176). The letter was prompted by a favorable review of Percy Simpson's new book, Shakespearian Punctuation, which argued strongly against modernization. James Thorpe's description of the punctuation and other non-verbal readings in early printings as an "opaque curtain" is typical of this later view (20-21), and echoes Fredson Bowers's famous claim (in his 1955 book On Editing Shakespeare and the Elizabethan Dramatists) that the goal of bibliography should be to "strip the veil of print from a text" (see Egan 47). Don Paterson's Reading Shakespeare's Sonnets (an edition with commentary in the tradition of Booth and Vendler) modernizes all spelling but retains a surprising amount of the original punctuation, including the serial colons in Sonnet 1 and elsewhere--though he does not explain his reasons for doing so. The only other exceptions are those editions that are explicitly marked as "old- or original-spelling" (e.g. Atkins and Hammond). Stephen Orgel (Pelican) and Stanley Wells (Oxford) follow a similar pattern, but turn the first colon into a semi-colon. Wells, however, adds a colon in the penultimate line (as a hinge between the two lines of the concluding couplet), where every other modern editor uses a comma. They are Sonnets 1, 7, 11, 12, 21, 68, 94, 109, 117, and 123. Sonnets 94 and 123 follow the same pattern as Sonnet 1, with colons at the end of all three quatrains and commas everywhere else. Adorno, Theodor W. "Punctuation Marks." Trans. Shierry Weber Nicholsen. Antioch Review 48 (1990): 300-305. Print. Atkins, Carl D. "The Application of Bibliographical Principles to the Editing of Punctuation in Shakespeare's 'Sonnets'." Studies in Philology 100:4 (Autumn, 2003): 493-513. Print. Bowers, Fredson. Textual and Literary Criticism. Cambridge: Cambridge UP, 1966. Print. Butler, Charles. The English Grammar. Oxford: William Turner, 1633. Print. Cable, Carole. "The Printing Types of the Doves Press: Their History and Destruction." The Library Quarterly 44:3 (July 1974): 219-30. Print. Carter, Albert Howard. "The Punctuation of Shakespeare's Sonnets of 1609." Joseph Quincy Adams Memorial Studies. Ed. James G. McManaway, Giles E. Dawson, and Edwin E. Willoughby. Washington: The Folger Shakespeare Library, 1948. 409-28. Print. Cobden-Sanderson, T. J. "Shakespearian Punctuation: A Letter Addressed to the Editor of The Times, October 26, 1911." London: Doves P, 1912. Print. Crewe, Jonathan. "Punctuating Shakespeare." Shakespeare Studies 28 (2000): 23-40. Print. Danielsson, Bror. John Hart's Works on English Orthography and Pronunciation. 2 vols. Stockholm: Almqvist & Wiksell, 1955. Print. Egan, Gabriel. The Struggle for Shakespeare's Text: Twentieth-Century Editorial Theory and Practice. Cambridge: Cambridge UP, 2010. Print. Finegold, Jonathan. Unpaginated prospectus for the Quatercentenary Edition of Shakespeare's Sonnets. Camptonville, CA: New Albion P, 2009. Print. Garfield, Simon. Just My Type: A Book About Fonts. London: Profile, 2010. Print. Graham-White, Anthony. Punctuation and its Dramatic Value in Shakespearean Drama. Newark: U of Delaware P, 1995. Print. Greg, W. W. "The Rationale of Copy-Text." Studies in Bibliography 3 (1950-51): 19-36. Print. Howard-Hill, T. H. Ralph Crane and Some Shakespeare First Folio Comedies. Charlottesville: UP of Virginia, 1972. Print. Hoyem, Andrew. Unpaginated prospectus for the Arion Press Edition of Shakespeare's Sonnets. San Francisco: Arion P, 1997. Print. Jackson, MacD. P. "Punctuation and the Compositors of Shakespeare's Sonnets, 1609." The Library 5th Ser. 30:1 (March 1975): 1-24. Print. Jonson, Ben. The Complete Masques. Ed. Stephen Orgel. New Haven: Yale UP, 1969. Print. King, Ros. "Seeing the rhythm: an interpretation of sixteenth-century punctuation and metrical practice." Ma(r)king the Text: The Presentation of Meaning on the Literary Page. Ed. Jo Bray, Miriam Handley and Anne C. Henry. Aldershot: Ashgate, 2000. Print. McKerrow, Ronald B. Prolegomena for the Oxford Shakespeare: A Study in Editorial Method. Oxford: Clarendon P, 1939. Print. Nashe, Thomas. Works. Ed. Ronald B. McKerrow. 4 vols. London: Sidgwick & Jackson Ltd., 1904-10. Print. Ong, Walter. "Historical Backgrounds of Elizabethan & Jacobean Punctuation Theory." PMLA 59 (1944): 349-60. Print. Parkes, M. B. Pause and Effect: An Introduction to the History of Punctuation in the West. Aldershot: Scolar P, 1993. Print. Paterson, Don. Reading Shakespeare's Sonnets: A New Commentary. London: Faber and Faber, 2010. Print. Quintilian. Institutio Oratoria. Trans. H. E. Butler for the Loeb Classical Library. 4 vols. London: Heinemann, 1921. Print. Salmon, Vivian. "English Punctuation Theory 1500-1800." Anglia 106 (1998): 285-314. Print. Shakespeare, William. Sonnets. London, 1609. STC 22353. Print. ---. Shakespeare's Sonnets. Ed. A. H. Bullen. Stratford-on-Avon: The Shakespeare Head P, 1905. Print. ---. The Sonnets: Tercentenary Edition. Ed. T. J. Cobden-Sanderson. London: The Doves P, 1909. Print. ---. Shakespeare's Sonnets. Ed. Martin Seymour-Smith. London: Heinemann, 1963. Print. ---. The Sonnets. Ed. John Dover Wilson. Cambridge: Cambridge UP, 1966. Print. ---. The Sonnets of William Shakespeare. Ed. Saul and Lillian Marks. Los Angeles: Plantin P, 1974. Print. ---. Shakespeare's Sonnets. Ed. Stephen Booth. New Haven: Yale UP, 1977. Print. ---. Shakespeare's Sonnets and A Lover's Complaint. Ed. Stanley Wells. Oxford: Clarendon P, 1985. Print. ---. The Sonnets. Ed. Helen Vendler. San Francisco: Arion P, 1997. Print. ---. Shakespeare's Sonnets. Ed. Katherine Duncan-Jones. Arden Shakespeare. London: Thomson Learning, 1997. Print. ---. The Sonnets. Ed. Stephen Orgel. Pelican Shakespeare. New York: Penguin, 2001. Print. ---. The Complete Sonnets and Poems. Ed. Colin Burrow. The Oxford Shakespeare. Oxford: Oxford UP, 2002. Print. ---. Sonnets. Ed. Barbara A. Mowat and Paul Werstine. The Folger Shakespeare Library. New York: Washington Square P, 2004. Print. ---. Shakespeare's Sonnets. Ed. G. Blakemore Evans. The Cambridge Shakespeare. Cambridge: Cambridge UP, 2006. Print. ---. Shakespeare's Sonnets. Ed. Carl D. Atkins. Madison: Fairleigh Dickinson UP, 2007. Print. ---. Shakespeare's Sonnets: Quatercentary Edition. Ed. Jonathan Finegold. Camptonville, CA: New Albion P, 2009. Print. ---. Shakespeare's Sonnets: An Original-Spelling Text. Ed. Paul Hammond. Oxford: Oxford UP, 2012. Print. Sherman, William H. "Early Modern Punctuation and Modern Editions: Shakespeare's Serial Colon" (forthcoming). Simpson, Percy. Shakespearian Punctuation. Oxford: Clarendon P, 1911. Print. Smith, Bruce. "Prickly Characters." Reading and Writing in Shakespeare. Ed. David M. Bergeron. Newark: U of Delaware P, 1996. 25-44. Print. Stallybrass, Peter and Roger Chartier. "Reading and Authorship: The Circulation of Shakespeare, 1590-1619." A Concise Companion to Shakespeare and the Text. Ed. Andrew Murphy. Oxford: Blackwell, 2007. 35-56. Print. Thorpe, James. "Watching the Ps & Qs: Editorial Treatment of Accidentals." The 16th Annual Public Lecture on Books and Bibliography, University of Kansas, 30 April 1971. Print. Tidcombe, Marianne. The Doves Press. London: The British Library and Oak Knoll P, 2002. Print. Van den Berg, Sarah. "Marking his Place: Ben Jonson's Punctuation." EMLS 1.3 (1995). Web. 9 Feb. 2012. Vendler, Helen. The Art of Shakespeare's Sonnets. Cambridge, MA: Harvard UP, 1997. Print. Warren, Michael J. "Repunctuation as Interpretation in Editions of Shakespeare." ELR 7 (1977): 155-69. Print. Wells, Stanley W. Modernizing Shakespeare's Spelling, with Three Studies in the Text of Henry V by Gary Taylor. Oxford: Clarendon P, 1979. Print. ---. Re-editing Shakespeare for the Modern Reader. Oxford: Clarendon P, 1984. Print.